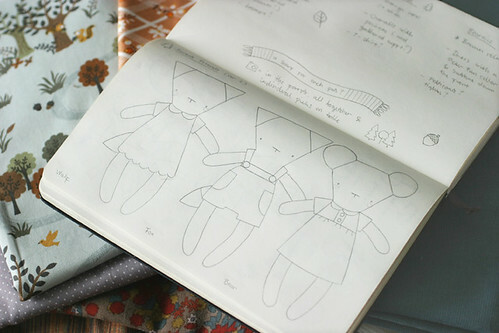 The Forest Friends, my trio for PlushYou!, are coming along nicely. It feels so good to be making things again, after such a long uncreative spell. While my mojo certainly isn't all back yet, it's still very good to create! It's been four years today since I made the very first Rag Pet as a present for my best friend's daughter on her naming day. (You can see Molly, the first ever rag-cat here: photo!) These four years have really just flown by, and even after all this time, I'm still loving making Rag Pets and my love and appreciation of soft toys has grown all the greater too. I think I'm not even a year old in this photo, taken by my dad. 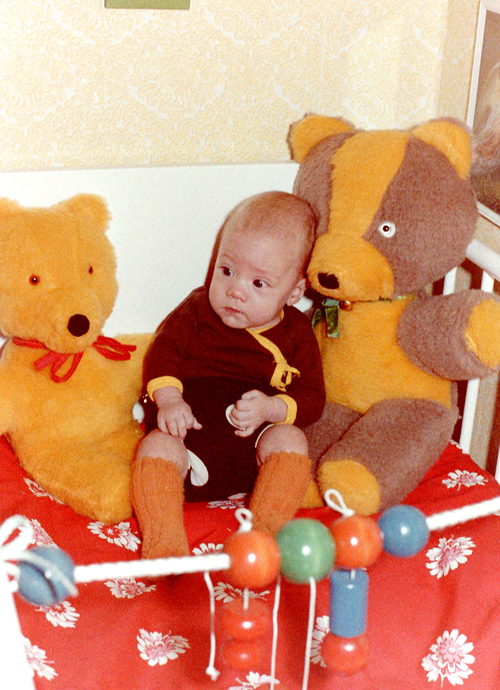 My grandmother made both me and my brother a pair of teddybears when we were born, and I do believe that my lifelong love of soft toys got started then and there! Gran also taught me to sew when I was about six years old, so I could make my own soft toys and she wouldn't have to hop behind the sewing machine every time I came up with an idea for a toy I wanted. As a kid, when all my friends would push about baby dolls in their toy prams, I would proudly cart around a soft toy in mine, and I slept with so many soft toys in my bed that it was a wonder I fitted in there among them at all! Then, in my late teens – early twenties I believed that I was much too grown up for soft toys, yet I still slept with a little stuffed cow I had made for myself. I would have been mortified had anyone found that out though. Now, in my thirties, I've come to the conclusion that you're never too old for anything you enjoy and once again hold my head up high amongst my plushies and I'm proud to be a toy maker. 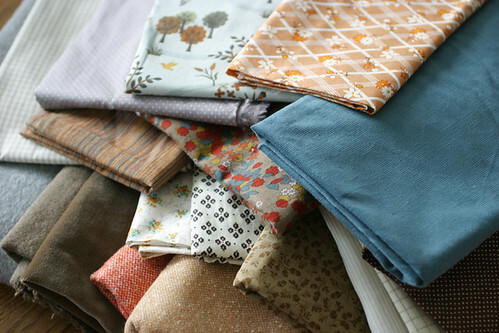 I'd never say that I have too much fabric, quite the contrary, I think I never have just the fabric I need, but at times it is a little hard to pick only a few fabrics from the piles of plenty. I have already managed to prune my assortment a bit though, and I'm sure it will all come together in the end, especially since I have a pretty clear image in my mind of what I'm wanting to do. 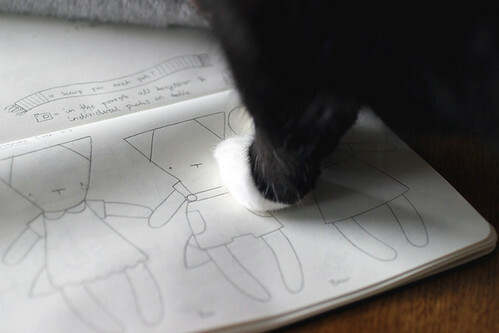 And I always have BooBoo at hand to help me with things too.